You will earn 1,555 Reward Points. Earn 1 reward point for every 1 dollar spent. Requires 120 volt, single phase power supply. Fan and air tunnel provide even heat distribution. 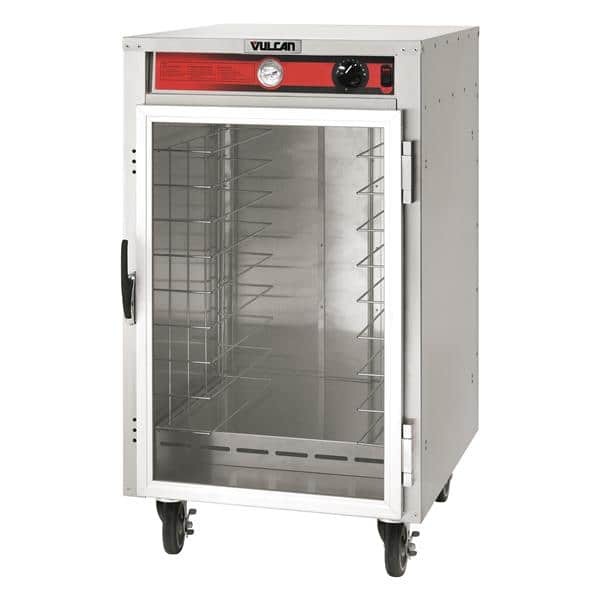 Heavy duty 20 gauge polished stainless steel cabinet. Set of 5" casters, two swivel with brakes and two rigid. Two 600 watt metal sheathed heating elements,10 amps total draw. Furnished with top mounted 8 foot power cord with strain relief and NEMA 5-15 plug. Full size glass door with field reversible heavy duty hinges, door latch mechanism, and gaskets. One year limited parts and labor warranty. After the first year, lifetime parts warranty on the heating elements. Fixed interior pan supports are designed to accommodate pan covers for transporting, and are removable for easy cleaning. Nine level holding and transport cabinet accepts nine 18" x 26" pans or eighteen 12" x 20" pans, pans may be up to 2 3⁄4" tall. Top mounted, recessed control panel includes power “on” and heater “on” indicator lights, dial thermostat adjustable from ambient to 190°F, and temperature read-out dial. Top mounted control panel is easy to use and out of the way of brooms, mops, and feet when transporting. Control panel on top eliminates removing control panel for cleaning. Nine level holding and transport cabinet, Vulcan Hart Model No. VHFA9. Heavy duty 20 gauge polished stainless steel cabinet. Four 5" casters, 2 swivel with brakes, 2 rigid. Glass door with heavy duty hinges, door latch mechanism, and gaskets. Interior pan supports are designed to accommodate pan covers for transporting, and are removable for easy cleaning. Accepts nine 18" x 26" pans or eighteen 12" x 20" x 2 3⁄4" pans. Top mounted, recessed control panel includes power “on” and heater “on” indicator lights, dial thermostat adjusts from ambient to 190°F, and temperature read-out dial. Two 600 watt metal sheathed heating elements, 10 amps total draw. One year limited parts and labor warranty. After the first year, lifetime parts warranty on the heating elements. Requires 120 volt, single phase power supply. Furnished with top mounted 8 foot power cord with strain relief and NEMA 5-15 plug. Classified by UL to NSF Std. #4.